So we're hearing a lot in the news lately about the so called "fiscal cliff" that the USA is driving towards with the pedal* to the metal. So what is this "fiscal cliff" all about? Simply put its the tax changes that are due to take effect in 2013 if congress doesn't act. The Bush tax cuts will end, the temporary reduction in payroll taxes of 2% of income will end, ATM patches will end (yet again) and some other changes will come as well. Some of the impact will be in increased taxes and some will be in decreased spending. How bad is this 'cliff'? Is the USA going to grind to a halt as our nation plummets down an abyss and then bursts into a fireball when it hits the ground? Thats how going over a cliff works right? The Camber of Commerce site has what they call 'A visual Breakdown' of the Fiscal Cliff. Not exactly the visual I was wanting, but its a start. They list the different tax and spending changes that are set for 2013. I count up $384B in tax increases. 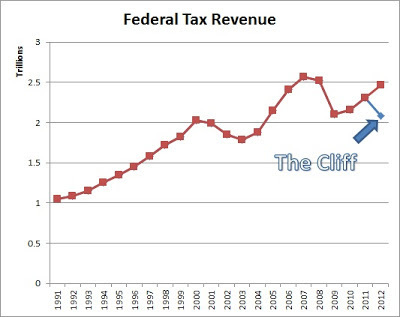 How does that amount compare to the federal tax revenue over previous years? 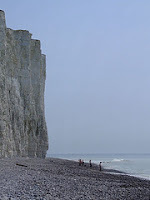 This cliff looks more like a weak speed bump to me. Now I am only looking at the revenue side. There is also some impact to spending side. But I think thats even much less dramatic. Cutting spending from expected $3.7 trillion to a mere $3.6 trillion doesn't seem like much of a big deal. * edit, fixed a spelling error. I knew that 'petal to the metal' didn't look right. Who Gets Bonuses at Work?